Elementary to collect “Birthday in a Bag” donations. A “Birthday in a Bag” is a bag that contains everything a family would need to celebrate a child’s birthday at home. 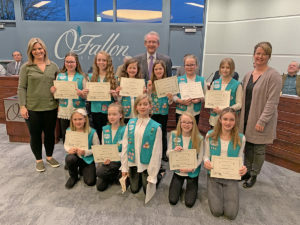 O’FALLON – Mayor Herb Roach and the O’Fallon City County recognized Girl Scout Troop 163 from Hinchcliffe Elementary school for their work collecting items to put together “Birthday in a Bag” donations for the O’Fallon Food Pantry. A “Birthday in a Bag” is a bag that contains everything a family would need to celebrate a child’s birthday at home. The girls set a goal of collecting enough items for thirty bags, but they were able to put together 193 and made donations to additional communities of Belleville, Caseyville, East St. Louis and Fairview Heights. Because of their efforts, the troop earned the Bronze Award, the highest honor for a Junior Girl Scout. The mayor and their troop leaders presented the girls each with a copy of the proclamation declaring March 18th as “Troop 163 Day” in O’Fallon and their Bronze Award pins. • Council approved on second reading the proposed development to be known as Mirage Wine and Spirits that is located at 2020 West Highway 50. This development has received several public comments against it since first appearing before the planning commission in February. The planning commission voted against the development 3-4 on February 12. The Community Development Committee approved it to go to council unanimously after adding a condition of fencing to be provided along the property line. City Council was divided during the first reading with a vote of 8-5 for the project. During the second reading at the Community Development Committee an additional condition was added for the placement of security lighting. Monday night, the council voted 9-3 in favor of the development with Ward 5 Alderwomen Gwen Randolph and Ward 6 Alderman Ned Drolet absent. • Approval of an ordinance amendment regarding the construction of utility facilities in the right-of-way. This amendment deals with the small wireless facilities companies are beginning to use and gives authority to the City Administrator to execute form agreements for use of the right-of-ways. • Approval of an ordinance amendment regarding the registration for all hotels, motels, lodging house and rooming houses. Hotels cannot be compelled to provide registry information without a warrant or subpoena. • The mayor will hold Saturday hours March 23 from 10:30 a.m. to 12:30 p.m.
• Ward 3 aldermen Matthew Gilreath and Kevin Hagarty will hold a Ward 3 Townhall on April 16 at 6:30 p.m. at City Hall. Residents are invited to attend.